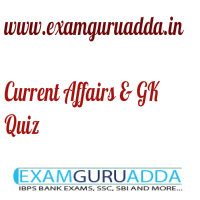 Dear Readers Examguruadda.in presents Current Affairs quiz of 3-4th December 2016 that cover important current affair events. Current Affairs quiz prepared according to the latest Bank, SSC and other competitive exam. 1. Which male athlete has been crowned IAAF male athlete of the year 2016? 2. The newly named King of Thailand belongs to which dynasty? 3. Who is the receiver of the International Children’s Peace Prize 2016? 4. The National Pollution Control Day (NPCD) is observed on which date in India? 5. Phulel Singh Sujlana, who passed away recently, was the former international umpire of which sports? 6. Who has been appointed as the interim Chief Executive Officer (CEO) of the National Stock Exchange of India (NSE)? 7. A book titled “The Modi Doctrine: New Paradigms in India's Foreign Policy” was authored by.....? 8. Who has been appointed as the new interim director of Central Bureau of Investigation (CBI)? 9. Bekal Utsahi, who passed away recently, was the renowned Urdu poet of which state? 10. Which country is hosting the 6th Heart of Asia conference 2016?